Crealine and Sensibio are the same thing. I have purchased this whilst in Paris however you can purchase it at www.escentual.com if you’re in the UK. They’re based in Cardiff so no ridiculous shipping charges. They also ship worldwide at amazing prices! This was first on my to buy list. I do have the two different solutions so will review them individually. This is a water based solution to cleanse and remove makeup for normal to sensitive skin but any skin types can of course use this. This claims to gently cleanses face and eyes as well as removing water resistant makeup without irritating or stripping the skin’s natural oil balance. First of all, I FREAKING LOVE THIS! Let me tell you why. This leaves my skin feeling clean, fresh and soft after removing make up without leaving my skin feeling tight or oily or red. It removes my makeup in a few swipes effortlessly with the use of 1 to 2 cotton pads. Each cotton pad doesn’t need to be fully soaked. The most astonishing thing is that it had removed my eyeliner easily with no trouble, and I use either MAC Liquidlast or the 17 Tattoo Me eyeliner which is “semi permanent” and requires pressure when using makeup wipes. I gently pressed the cotton pad onto my eyelid for 5 seconds then swipe and bam! Eye makeup melts and is removed with ease. Because this is suited for sensitive skin, the ingredients in this doesn’t break me out. Alcohol free, fragrance free, paraben free. I’m not sure if the product is suppose to have a cool feeling when applied onto the skin or if it is the UK weather but I do like the cool feeling and feels like it calms my skin down. It looks and feels like water. I like to use this as a cleanser too and doesn’t require to be washed off afterwards. This specific product had lived up to all the hype. I really do recommend this 100% and will definitely keep purchasing this. My new HG product. I do recommend this over the Sebium one. Review for that coming soon. Maybe a comparison? Next Post Is That You Spring? I Recently got this when I went to France and I have to say I'm loving it! Thank you for the website! Will totally help when I run out thanks!! I have the Sebium one and I love it :3 I have really oily skin, so it's amazing when I'm taking my foundation off. 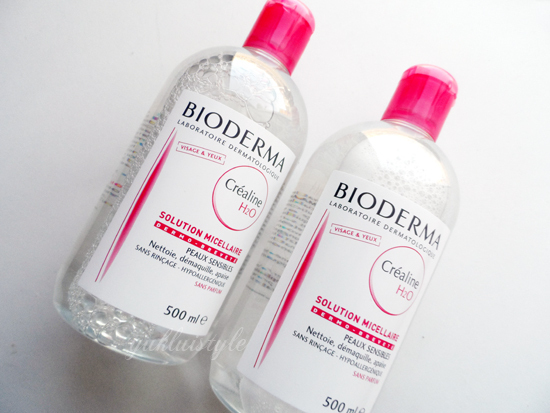 For me, bioderma is a really nice company. Omg, everyone recommend this product!! I should totally get it!